The smartphone connects us with our families and friends, but in the recent days this has become an unwanted call. Although the mobile number is personal, it is unknowingly handicapped for some reason. In such cases, we have to face phone calls of spam calls, telemarketing calls or troubleshooting elements. If the number belongs to a girl, then this problem gets bigger. The good thing is that you do not need to be disturbed by unnecessary calls. You can block them. In this article we will tell you how you can block any phone number in your Android smartphone. Almost all Android phones come with built-in call blocking features. But this process can be a little different in every company's smartphone. Smartphone manufacturers such as Chaomi, Lenovo and Samsung have made radical changes in this process in their software. It's possible that the process for which you have a phone is slightly different. But the difference will not be too big. Let us tell you about the process of blocking numbers in popular Android smartphones. 1. Open the phone app. After that go to the section containing the Recents Calls. After this, long press any number and select block number. 2. The second way is connected to the phone app. Open the phone app. You will see a three dot icon in the top right hand corner. Tap on it and go to Settings. Select "Call Blocking" from the menu here and place the number that is to be blocked. You may have a Samsung phone Block any number in this company's Android phone ...1. Open the phone app.2. Choose the number to block. After this, select the three dot on the right in the top right.3. After that you select the block number. The number blocking feature on the Samsung smartphone is similar to stock Android. In this you have to go to the section containing the registers. After this, keep any number of long press and select block number. 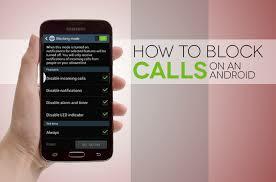 If your Android phone does not have in-built call blocking feature. Or you can not find this feature then you have another way to block any phone number. You can download any third-party call blocking app from the Google Play Store. You can choose any of Mr. number app, call blocker app or calls blacklist app.